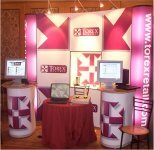 At Expo we aim to satisfy our clients exhibition needs with the full service. We are grateful for any feedback or comments you may have about our service. If you are a new or existing client, please feel free to email. I would like to thank Paul for all his hard work on getting our Pull up's and posters produced so quickly, they look fantastic! They are now in Spain at the show, and I'm sure they will stand out from the crowd! Just to let you know that we have received the banner and desk and put them both up...we are very pleased, they look fantastic and we love the desk, what a great design! The artwork on the banner is perfect and will look great at the show. Thanks for all your efforts. The banner was spectacular and the very best one there. We had the prime spot and the Cabinet Secretary for Health went to only one stall - our's! Banner now has pride of place in our Information Centre. It looks amazing!!!! We are so blown away by how great it is and how brilliant you have been to turn it around so quickly, thank you so so much. Our clients will be over the moon!! Just a quick email to say thank you for a great job with the panels, we are really pleased with them and you were efficient as ever. 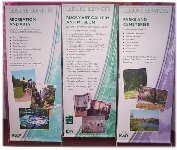 Just a little note to say thanks very much for the Leisure Services banners which arrived safely and look fab! Thanks for all your help. 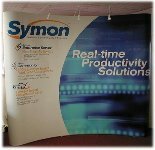 I would just like to say a big thank you for delivering the display panels to us in time for our big Conference in Torquay! It's going with a swing at the moment and the display looks great! Thanks again for pulling out the stops and doing this so quickly for us - it's much appreciated. Just a quick note to thank you for sending Paul along to put up and pull down the stand in London this week. He followed instructions completely as I'd set out in my email which was really impressive. Its great to have such reliable people I can call on for these occasions. promptly at the venue, he was courteous, efficient and had the stand up and looking fantastic in no time at all. The show went really well thank you. 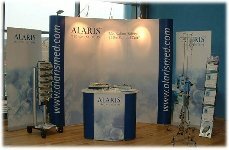 The expo kit was great and easy to erect. 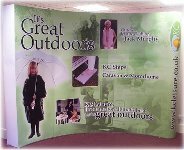 We are really pleased with it as we have another few shows coming up imminently and we already feel quite prepared as far as the stand is concerned. I have attached a couple of pictures (not great quality I’m afraid) to show you how it transformed our otherwise boring white stand. Thank you for all the work you have done for AVS in the run up to the launch of KC Leisure. As you know, we have started exhibiting and if we have the success we had at York last weekend we will be extremely pleased. Once again, thank you for all your advice, assistance and overall results you have helped KC Leisure achieve. What a service Pam ! Many thanks for your help. Thanks again for all your hard work in getting our graphics over to us so promptly. We are really pleased with the results and look forward to working with you again. 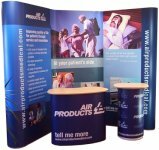 Expo Display Service has proved to be exteremely reliable in the delivery of portable stands. 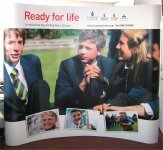 Their team fully briefed us on all the options available, contributed to the design process, and delivered a stand that was perfect to our needs. 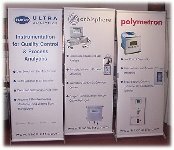 Full credit must go to the Expo Display team for delivering such a unique, eye-catching product that didn't exceed our budget. 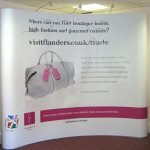 For great value stands with a premium quality look, matched with reassuring customer service, I would thoroughly recommend Expo Display without hesitation. Pam, thank you for your prompt, corteous and professional service. It is great to find a company who deliver their promises. Thanks again for all you help with this, we are very pleased. We'll definitely be coming back for updated artwork as and when its needed.